"Sky has thrown down the gauntlet"
With Sky announcing broadband TV and thus its intentions towards film and TV streaming this week, should the existing services be quaking in their boots? After all, Sky already has robust deals in place with movie studios that feed its much-loved premium Sky Movies channels as well as having a couple of fingers in the production pie and premium sporting coverage to boot. Scary stuff for Lovefilm, Netflix and Blinkbox then? "Sky has certainly thrown down the gauntlet by breaking away from its traditional subscription model," Blinkbox's chief operating officer Adrian Letts told us. But it's not all doom and gloom as Letts added that the extra competition could bring prices down: "Increased competition can only benefit the customer in the long term and service providers will be more aware than ever of price point". Sky's entrance to the streaming market puts more emphasis on TV programming, echoing the way things were going anyway. Even the advent of Netflix helped focus the services on their televisual offerings, with Lovefilm's chief marketing officer, Simon Morris telling TechRadar, "TV always has been and will continue to be an important part of our offering." Amazon-owned Lovefillm is no stranger to competition, having taken on the high street and won, even in its very early days when "the industry was very aggressive and arrogant". But with free on-demand catch-up services like iPlayer, 4OD, YouView and ITV Player making their way on to every console, tablet and smart TV out there, the film catalogue will become more important to these streaming services. So Sky has Sky Movies which would seem to give it an unfair advantage – after all, its pay TV on top of pay TV that has still managed to pull in thousands of subscribers with its alluring film line-ups. But Sky has come under fire for making "excessive profits" on Sky Movies and is now required to make public when its deals with the six major Hollywood studios are coming up for renewal so that other services are able to bid. "Premium online video services such as Sky are all helping to grow the market and raise awareness of internet-delivered movies and TV," said Letts. "Sky's new service [will] really play to its strengths of high value sports programming, however, at Blinkbox we're totally focused on offering the latest movie releases in the highest quality available, to deliver the best viewing experience for our customers." It's these latest movie releases that will win and lose the streaming war. 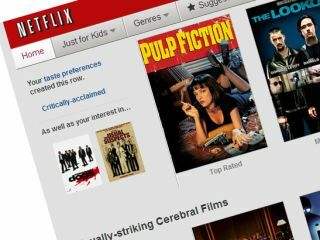 Netflix, for example, is already coming under fire for its aging back catalogue – although the company chose not to talk to us for this article, its chief product officer Neil Hunt told us at the launch that Netflix is going after "the richest possible content that we can afford for £5.99 a month" and that doesn't include bleeding-edge blockbusters. Sky hasn't revealed its pricing structure yet, but has said it will be a hotch potch of pay-per-view and subscription streaming; if it can compete with Netflix on price and out-do it on content, the 'flix may be in trouble. The more flexible services, like Lovefilm which offers a combination of streaming subscription, newer films on PPV and physical DVD rentals, and BlinkBox that simply asks you to pay individually for each film, may sit more easily alongside Sky's new service. Until we know more about Sky's plans for its broadband TV offering, it's all a bit up in the air. What's for sure is that the British consumer will soon have even more streaming options to choose between – gauntlets have been thrown, let the battle commence.